Don’t miss this gem! If you’ve been looking for the perfect place for a winter family retreat, you’ve hit the jackpot. Nestled in the Rocky Mountains seven miles west of Buena Vista, Colorado, Spring Canyon creates a dream vacation along with a spiritual dimension uniquely fit to satisfy your desires. Set up as a Christ-centered sanctuary to refresh, equip, and inspire families, the mountains and lake provide a beautiful backdrop for soaking in exquisite views, hiking up backwoods roads, trails, and mountains, all while ensuring you have the log-cabin experience in a lodge, chalet, or cottage. 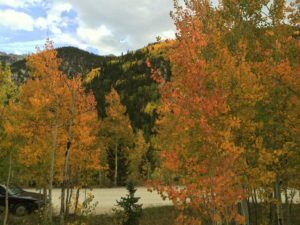 If your timing is right in the Fall, you can spend hours wandering through the aspen forests, letting the sunlit golden, orange, and red leaves penetrate your mind, clearing away the burdens of a typical week at home. The stunning sights prompted me to take a picture of the aspens at Cottonwood Lake, a lake within hiking distance of the camp, and display that memory on my phone’s main screen background. Gorgeous! Officers’ Christian Fellowship runs Spring Canyon, which is named for the mountain spring that runs through the conference center. The water is crystal clear and a delight to drink from any faucet around the facilities. The water is only part of the healthful environment. Hard-working staff members strive to meet your needs while you vacation at the camp. A wide-range of Christian programs are available for adults, teens, and children. During the family conferences, parents usually attend sessions in the morning and evenings, with afternoons free for their families. The daily routine includes meals served family style in Hartley Holmes Lodge. A devotion and prayer before each meal gives food for thought while spending time with other guests around the table. Each meal is a treat with surprises throughout the week. Don’t forget to save the utensil left hanging on the wall for dessert after the meal. Lodges and chalets have small kitchens for use when desired, but I’ve always enjoyed the gatherings for fellowship and building relationships. Usually, in the middle of the week, the schedule sets a day aside for family adventures. For local fun, there is a climbing wall at the Hemmingway Operations Complex, a fish pond, a sled/toboggan run, horse-back riding (weather dependent), skiing, snowmobiling (weather dependent), hiking, and mountain climbing (weather dependent). Both of our boys loved hiking up mountains, including “The Hook,” a local peak over 12,000 feet, and Sheep Mountain, over 11,000 feet. The staff takes great care to ensure your safety in all outdoor winter activities. Two ski lodges are nearby – Monarch Mountain and Ski Cooper. 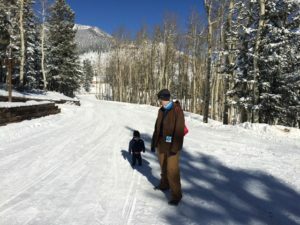 Our family enjoyed the frosty air, slippery slopes, and a variety of trails for skiers and snowboarders. The ski lodges have tremendous food, hot beverages, and fire-places to warm your frozen fingers. The most valuable part of the experience for me has been the spiritual inspiration I’ve received from leaders at Spring Canyon, which has deepened my walk as a Christian over the years. The views are God’s incredible backdrop the staff uses to re-invigorate you in your faith. Often the speakers deal with issues that give any Christian concerns in our daily life. They build a sound Biblical basis in their teaching, Jesus Christ being the chief cornerstone. My family and I have visited Spring Canyon for many reasons including refreshment, relaxation, adventure, excitement, and spiritual growth. 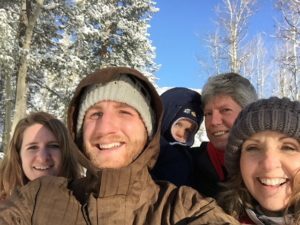 Your family will love visiting Spring Canyon and drinking in the fabulous atmosphere of God’s love in the Colorado Mountains. Check out the Spring Canyon website: http://www.springcanyon.org/.